Access to Hidden Grove is very easy. Follow Sechelt Inlet Road approx. 6 km from downtown Sechelt. When you get there you'll find lots of off-road parking. The Grove and Sechelt Heritage Forest areas are a unique combination of ancient giant trees, maple wetland and startling rocky promontories with some fantastic views of the Sechelt Inlet and out towards Vancouver Island. There are many trails to choose from and most are minimally challenging for the average hiker. It is thanks to local residents of the area that the Sechelt Heritage Forest was established back in the 80's and 90's. In 2000, when a local resident noticed logging tapes in the Hidden Grove area the movement to save this beautiful forest began. However, it was only in February 2011 that the Sechelt Groves Society was officially incorporated. Thank goodness for the hard work of these local residents! As you might guess if you've looked at my site much, one of my most favourite things about this fantastic old growth forest - it is a legal off-leash area for well-behaved doggies! It is really fantastic to have an area such as this that doesn't insist on dogs being restrained. However, please be aware that because of this there are lots of people on these trails with their dogs. It is still important for everyone to keep their own dogs under control so that there are no unfortunate incidents. It would be a shame to lose this off-leash designation. 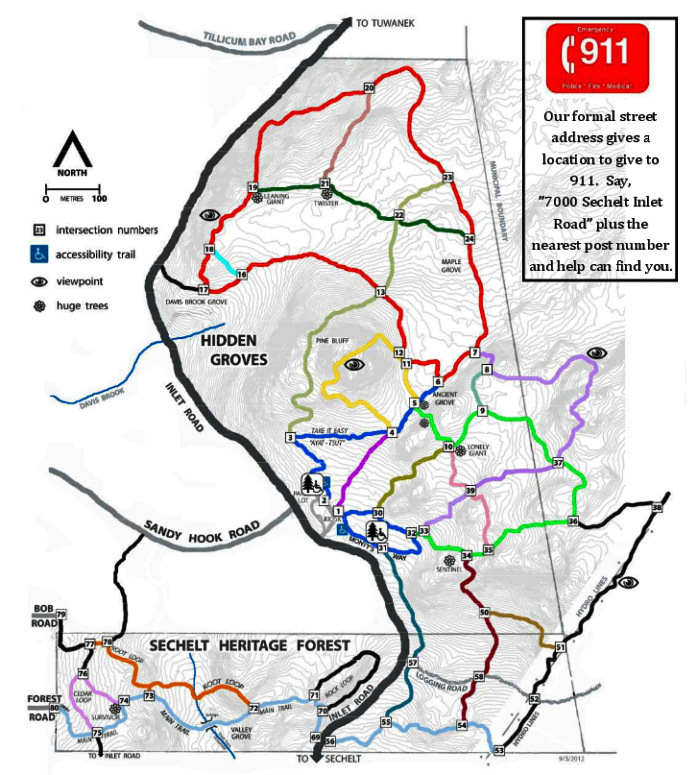 After some thought, I decided not to create my own map of this area as the one below is well done and the trails themselves are very well marked with posted maps at nearly every single intersection. So no directions or trail descriptions. Please check out the Sechelt Groves website if you are interested in finding out more information. Click on the map below if you want to download a pdf copy of this map. Click here to return from Hidden Grove to the Sunshine Coast Trails Home page.